Acogedora casa, perfecto para 2 o 4 personas, espacio de vida muy cómodo, decoradas para todas sus necesidades, con 2 dormitorios y un baño grande. Hermosa playa para su disfrute con vistas a tomar aliento. Un montón de patio de arena con una gran cantidad de palmeras con un montón de espacio de estacionamiento cerrado. Una de las propiedades mejor guardados de la zona. Cuidadoso, leal y responsable cuidador de la propiedad, 25 años de servicio cuidando a nuestra familia y nuestros huéspedes. Dentro de 5 minutos en coche desde el pequeño pueblo pesquero de Chuburná Puerto. Esta zona de la península de Yucatán es único y diferente del frenesí de Cancún! Los lugareños son genuinamente hospitalario y esto definitivamente no es una trampa para turistas. Muchos canadienses americanos y ya llaman a esta zona de la casa, algunos para el invierno y algunos han comprado hogares y vivir aquí. 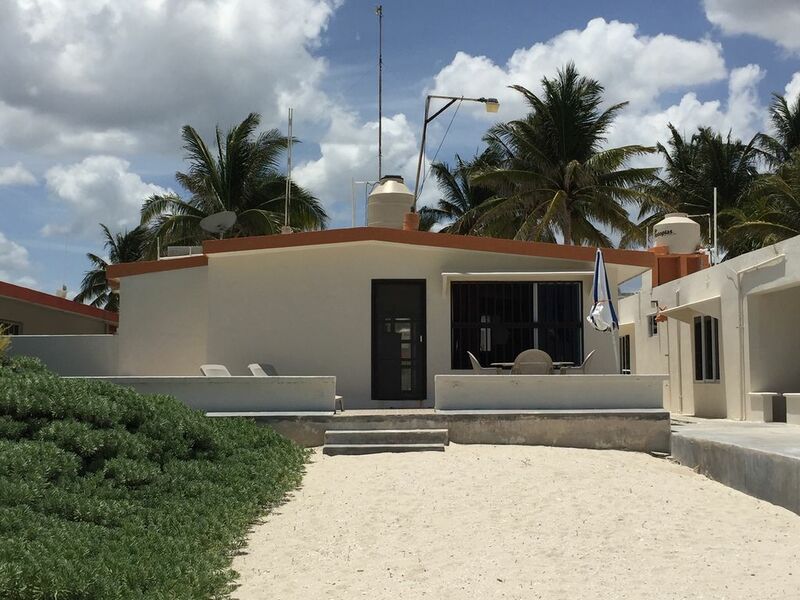 Nuestra casa de playa está situado entre las localidades de pesca respetuosos de Chelem y Chuburná. Chelem y Chuburná ofrecen pequeños restaurantes, tiendas de comestibles y mercados de frutas y carne para sus necesidades diarias. Esta propiedad se encuentra a 35 minutos de la hermosa ciudad colonial de Mérida (código del aeropuerto es MID). Esta casa de playa fue remodelada durante el verano de 2008, y amueblado todo con nuevos contenidos, incluyendo la vajilla Kichen y electrodomésticos. Está completamente amueblado para una gran comodidad y relajación, durante una semana o meses a la vez. Nuestro portero propiedad, una persona de confianza que ha trabajado para nosotros durante 20 años, vive 2 casas más abajo y se puede acceder a través del teléfono celular. Su madre y su esposa también cocinar y tienen servicio de lavandería por un cargo adicional. Limpieza de la casa también se pueden arreglar por un cargo adicional. Yucatán es conocida por sus habitantes locales hospitalarios y muy amable. Esta hermosa casa frente al mar se encuentra entre una combinación de vecinos internacionales, entre ellos estadounidenses, británicos y canadienses, quienes han encontrado esta área para ser hermoso, tranquilo y lo suficientemente amable para llamar a casa. No es una trampa para turistas, es una pieza perfecta de paraíso para relajarse por completo y alejarse de todo y sin embargo lo suficientemente cerca como para otras actividades. El puerto de Progreso, a 15 minutos de distancia, tiene actividades de agua, tiendas y restaurantes. Y la hermosa ciudad colonial de Mérida, a 35 minutos de distancia, tiene muchas opciones de compras, gran variedad de restaurantes y varios espectáculos culturales libres. También hay muchas ruinas mayas, ríos subterráneos (cenotes), haciendas, y numerosos pueblos únicos y puertos que se pueden visitar como excursiones de un día. Nuestra familia tiene vacaciones en Chuburná, con nuestros 4 hijos, desde hace 20 años. Tenemos la intención de retirarse allí algún día y empezar a disfrutar de nuevo con nuestros nietos. Cualquier persona que visita la península de Yucatán es seguro de caer en amor con su tierra hermosa, océano, y su gente excepcionalmente amable! Esperamos poder compartir nuestro pequeño trozo de paraíso con todos ustedes! This pretty casita is located around 20 minutes walk from Chuburna Puerto, the nearest village. There you can buy groceries, beer, fish and some meat, but there is no big supermarket. The house has an excellent layout, with two bedrooms and a nice open living area where you can cook while chatting to others in the seating area. A large window has a great view of the Gulf of Mexico and the sea comes up to a few meters from the house. There are plenty of plastic chairs outside, two good sun loungers and a big outside picnic table, so we spent lots of time every day on the beach. The owner, Leticia, responded immediately to our request to the Property Manager (Carlos) to repair the corroded stove by buying and installing a new one, so we were impressed by the quality of service from her. There is a regular Combi - Collectivo - service from Chuburna Puerto into Chelem and Progreso, which are the next bigger villages to the East of Chuburna Puerto. Chelem has more restaurants and shops then Chuburna. Progreso is much bigger with two large supermarkets and is a tourist destination for large cruise boats from Galvaston and Alabama twice a week. We really enjoyed the peaceful, quiet nature of Chuburna Puerto. It is right at the end of the development line along this part of the coast. It easy to make friends here as the 'Gringos' are very friendly -- some rent and some live here permanently, and there are no big hotels for tourist types. We stayed in February and most of the houses are unoccupied, except for Mexican holidays when parties arrive from Merida and enjoy lots of music and swimming all around, usually for a couple of days. Thank you very much for sharing your vacation experience in our "Great Little Casita". I appreciate your comments and description of the house, the area, the locals, and of the new residents, American and Canadians, that have recently discovered our small piece of paradise. You described your experience very well from a guest's perspective in a simple and sincere manner. Thank you for the opportunity to have you as our guests and we hope to have you all come visit the beautiful and hospitable Yucatan again! Muchas gracias! Early morning coffee on the front deck. Birds calling to each other, Pelicans dive bombing for breakfast..and Dolphins making a splash. Walk across the sand and wiggle your toes in the gulf wates...find sea glass and shells. After a glorious sunset wait for the moon and stars. If you ever need any help call Carlos. (he lives next door)...he has been the caretaker for many years. The owners are just an e-mail away. Miss Kitty (my older cat) and I have loved being here for 2 years. We hope to return after visiting our family in the states. Exactly as described in the rental information. The photos showed exactly what was in the house upon arrival. Very clean and well maintained. The caretaker was always just a phone call away and very helpful with showing where many things were located in the house. Water tank, cleaning supplies if needed, etc. The owner was always helpful when contacted, I have recommended this place and the house to my friends and relatives in the US and would be open to contact with anyone who would ask. The beaches were clean and uncluttered, shelling was wonderful. My favorite restaurant "Triton"" served the best Boqinete and Gruper ''de la plancha''(grilled) service and setting were perfect. Thank you Beautiful Yucatan for the best pre/retirement stay ever. We very much enjoyed our time in Chuburna. The 7 months spent on the beach front house were wonderful. The beach is large and so empty .Carlos the caretaker is always available and such a friendly person. We loved it. Glad to know your stay was enjoyable in the beautiful Yucatan! It was very nice meeting you both during my short visit to Merida. As soon as we get all of our kids in college, my husband and I are looking forward to spending a lot of time there and are happy to know we will be having you all as neighbors in Chuburna, Yucatan. Muchas gracias! We enjoyed a delightful, peaceful week here in November. The house is light, airy,and colorful.The kitchen well equipped.The water was warm enough for swimming, and the breeze blowing through the house was comfortable. *We offer special rates for LONG terms guests and for RETURN guests. *BETTER PRICES offered to guests who stay for several months at a time. *Pet fee pricing will be according to length of stay. *Property caretaker fee will also be according to length of stay. *Additional guest fee for more than 4 people apply. It will be $10 a person per night after 4th guest.